Apple introduced new models of the MacBook and MacBook Pro. MacBook Pro models feature the latest Intel Core 2 Duo processors (running at up to 2.6GHz with 6MB of shared L2 cache), larger hard drives (up to 300GB), and 2GB of memory standard in most models. They also include the latest NVIDIA graphics processors — with up to 512MB of video memory — and an innovative Multi-Touch trackpad, first introduced in MacBook Air. The three new models of the MacBook feature faster processors and hard drives: sleek white 2.1 GHz and 2.4 GHz models with 120GB or 160GB 5400 rpm hard drives and a stunning black 2.4 GHz model with a massive 250GB 5400 rpm hard drive. 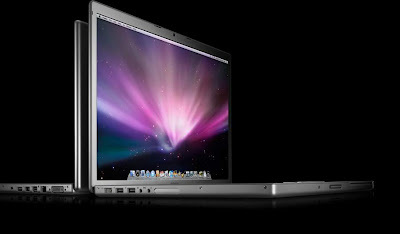 The 2.4 GHz MacBook ships with 2GB of memory standard, expandable up to 4GB across the line. Available immediately, the new MacBook and MacBook Pro models start at just $1,099 and $1,999, respectively.